Leicester City have announced that Riyad Mahrez has signed a new contract at the club. The Algerian winger has committed his future to the Foxes until 2020. Mahrez was signed by Leicester City from Le Havre in January 2014 and was been a vital part of their title-winning campaign last season. Mahrez has been constantly linked with a move away from the club with Arsenal heavily linked with him. 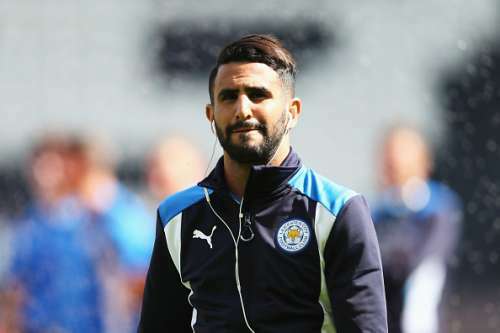 Riyad Mahrez’s two-and-a-half-year spell with Leicester City so far has seen him establish himself as an Algeria international, a Premier League champion and one of the most sort-after attacking midfielder in Europe. He scored 17 goals and contributed 11 assists last season in what can be called as the most remarkable title triumph in Premier League history. He becomes the FIFTH member of the Premier League winning squad to a contract extension at Leicester City after Wes Morgan, Jamie Vardy, Kasper Schmeichel and Andy King. Arsenal were said to be very keen on signing him and Jamie Vardy from Leicester City but the move never managed to materialise. Vardy was close to joining the Gunners after they triggered his release clause, but he instead signed the contract extension at Leicester City. Mahrez was said to be keen on joining Arsenal despite the clubs not being in advance talks for him. There were rumours of the Algerian joining Chelsea too after he was spotted in the same hotel as Chelsea manager, Antonio Conte. The hotel in the context was also hinting towards a move to Chelsea as it was the club’s official hotel in London that the player decided to go to. He was there along with his agent to make things more interesting. Speaking to France Football, the Algeria international was full of praises for manager Ranieri for his influence and believes. He has revealed that Ranieri has turned him into a better player. “He immediately took me under his wing and gave me a lot of confidence. And he has brought me to be more rigorous with my game. The result of that: last year, I defended like a crazy person. He made me understand that if one of us did not defend, we were dead. With him, I also timed better the moments where one needs to press, when one needs to peel off, things like that.” he said.